Pellettieri Associates offers a full range of consulting services in site planning, landscape design and construction administration and implementation. As a Design/Build firm, we direct our efforts to landscape master planning and technical problem-solving simultaneously. For that reason, Pellettieri Associates is able to provide complete project conceptualization, management and implementation with stunning results. With over 20 years of experience, Mr. Simon has provided award-winning design abilities and a range of services including public art, architectural planning, landscape design, site planning, and management for public & private clients throughout the United States. With a focus on sustaniable design, Paul specializes in modern gardens, signature development solutions, high-end residential design, resort design, courtyards, public parks, municipal facilities, memorials and sculptural works. In addition, Mr. Simon brings a wealth of knowledge & guidance on project permitting, municipal requirements, green design initiatives, sustainability, Architectural access board requirements, ADA Americans with Disabilities Act requirements, engineering design, grading, storm water drainage design, rainwater harvesting, irrigation design, environmental resource management, and lighting design, from schematic design level plans through construction documents and construction administration services. My small company has over 30 years experience designing, installing and caring for Gardens of all types. We specialize in sustainable/organic practices; on estates and commercial spaces.We have done projects in RI, MA., NH and CT. Check out a showcase of our work here: <a rel="nofollow" target="_blank" href="https://vimeo.com/204302636">https://vimeo.com/204302636</a> db Landscaping LLC was founded by Daniel Bruzga, who is a Registered Landscape Architect and holds degrees in both Landscape Architecture and Horticulture. The company was founded and continues to operate based upon the principle of providing high quality personal service throughout the design and construction process and continuing after your project is built. Our focus on quality and attention to detail ensures that the landscapes we create will be lasting especially in the challenging New England environment. db Landscaping LLC provides comprehensive services to complete your project, we also take pride in constructing the work of various other design professionals. 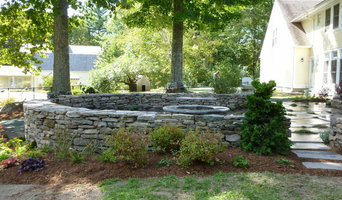 A landscape design/install firm, we specialize in customer service. Focusing on quality design solutions, Laura works with homeowners to create elegant and usable landscapes. Her design concepts are clear, and her knowledge of plants is extensive. Her team of experienced installers will proceed with efficiency to turn the design into a reality. We strive to provide solutions that meet your needs in a timely and expert fashion. We will see your landscape through from the first sketches to the placement of the last piece of mulch. We are ready to help you with any medium-sized project, and have the equipment and expertise to mold your landscape, from site work to plant installation. 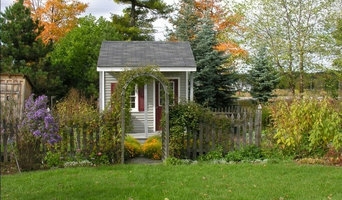 Let us make the most of your landscape by envisioning your outdoors as a series of green rooms. We will recognize and make the most of potential views, identify what needs screening, and provide beautiful surprises for you as you move through your landscape. We design, install and maintain ponds, waterfalls and water features. In the pond business for 23 years with projects on three continents we bring our passion and expertise to each project we're a part of. We design, build and maintain the crafted landscape for clients who appreciate a thoughtful approach to something that surrounds them every day. We make beautiful gardens and spaces/features around gardens. Landscape Architecture Firm Celebrating its 25th Anniversary! Approach to Design: My approach to design is often the resolution of aesthetic, functional and technical concerns, I believe it is also our responsibility to assist our clients in truly understanding their site, identifying its inherent opportunities, and articulating solutions that reflect the place’s unique history and identity. Firmly Rooted is a full service, fully insured landscaping company offering design, installation, and maintenance for both commercial and residential clients. We have been in business since 2004, and have over 15 years of experience in all aspects of the field. New Yard Landscaping & Sitework, offers over 24 years of experience in residential and commercial landscaping projects. We pride ourselves on professionally completing projects that meet our customers expectations, on time, and within budget. Our company is driven by and committed to, delivering RESULTS that ADD VALUE to your INVESTMENT. 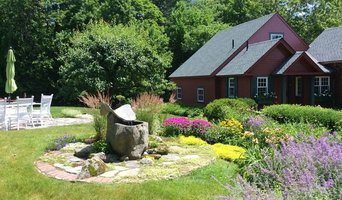 Houzz is a great place to start your search for the right Warner, NH landscape architect or designer. You can either browse outdoor photos and find professionals linked to them, or you can browse our professional directory, see their latest projects, read reviews, and narrow down your search based on your style preferences. Once you’re down to a few, reach out and get some quotations to make your final choice.